“Ebru” has long been the name given to the original Turkish art of “paper marbling” and to the “marbled” designs transferred to paper or fabric produced by Ebru artists. Classical ebru is produced in a rectangular trough filled with water mixed with a mucillagenous solution, traditionally prepared using gum tragacanth. The colors, made of natural pigments mixed with ox-gall, are sprinkled over the surface of the water with brushes made of rose stalks and horse hair. Pins, needles, and combs are used to swirl the colors into one another, thus producing a design on the surface of the water. Paper or fabric is laid carefully on the design, and as the paper is lifted from the surface of the water, the design transfers completely to the paper. “Ebru” has been used not only for fine works of art displayed in homes and galleries worldwide, but also for backgrounds to caligraphy, borders for inscriptions, and endpapers in finely bound books. My friend and Ebru artist Garip Ay introduced me to this fascinating art. After graduating from Diyarbakir Fine Arts High School he graduated from Mimar Sinan Fine Arts University, Traditional Turkish Arts Department. 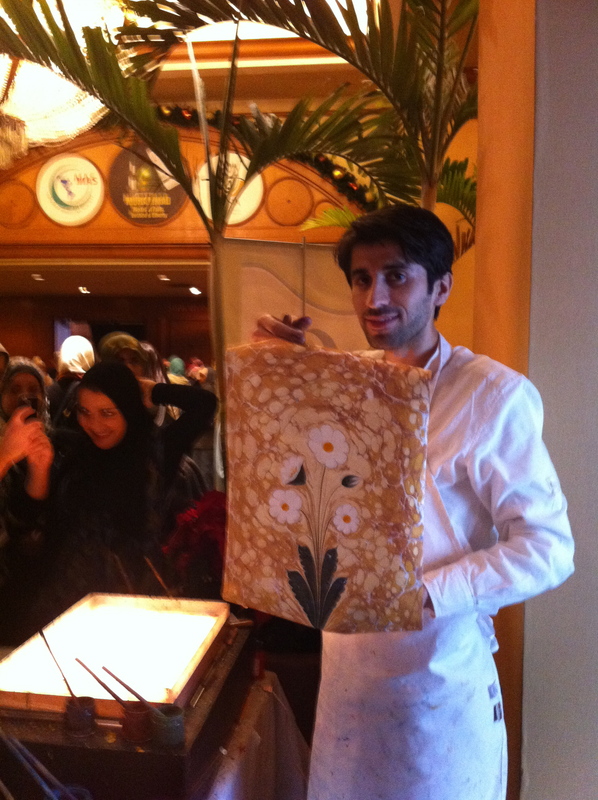 Besides calligraphy he majored in Ebru (marbling) as student of Hikmet Barutcugil. He was an assistant of Hikmet Barutcugil and worked in his studio from 2007 until may 2011. He has received the diploma from his ebru master in 2011. He attended several exhibitions and seminars Abroad. Also he developed several projects such as “Drawings on Barut Ebru”. • 2009 Turkish Cultural Association. Copenhagen Denmark. • 2010 Aramco Exhibition and Workshops. Dammam, S. Arabia. 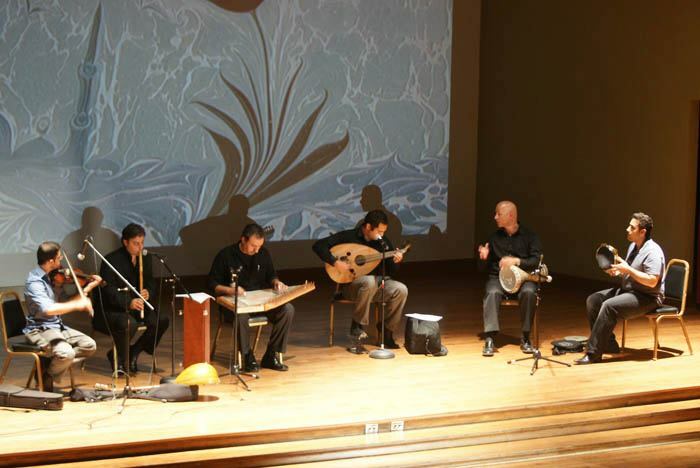 • 2010 4. International Islamic Arts Convention. Kuwait. • 2010 Turkish Cultural Fest. Lisbon Portugal. • 2010 Kazan Ministry of Culture. Kazan Russia. • 2010 Turkish Products Exhibition (ITO). Damascus, Syria. • 2010 Emirates Palace (Abu Dhabi / UAE). • 2010 Gallery Kazan Kremlin (Russia). • 2011 Matka Tourism Fair. Helsinki, Finland. • 2011 Turkish Products Exhibition (ITO). Tirana, Albania. • 2011 Chicago Turkish Festival. Chicago, USA. Being from Damascus the hub of trade in the Middle East, buying and selling is in my blood. From door-to-door peddlers to pushcart owners to purveyors of fine Damascene fabric, Syrian immigrants have always been known as merchants. So when I was told about the Little Africa -Black Wall Street (Greenwood) in early 1920’s Tulsa, Oklahoma, I immediately felt a kinship with them. Then I went there to visit and met Imam Br. Arthur L.Farahkhan. I felt immediately at home and a strong sense of brotherhood flourished. Br. Arthur had once heard his great grandfather, who lived to be 111 years old, mention the events of May 31 and June 1 of 1921. He knew that there was a big scare, or massacre, that his great grandfather and other elders were trying to conceal. It wasn’t until 1990 when he learned the full story. During a dinner banquet organized by the Tulsa Muslim American Community, one of the first Muslim organizations in Oklahoma, he met Mabel Little, a successful businesswoman who had lived through the events. Ms. Little had written a book entitled “Fire on Mount Zion” and shared all of what she knew with Br. Arthur. “The Fire on Mount Zion” ignited Br. Arthur’s lantern and he became the next generation’s resident authority on the subject. 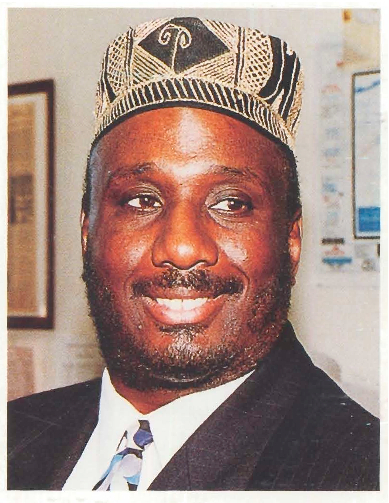 As both a Muslim Imam and a Community Activist he attended many civic activities including interfaith events and conferences. In 1989 he represented Imam W.D. Mohammad in an interfaith dialogue conference in Toronto Canada. His talents developed from there in many different directions: he trained clinic staff to teach homeless people about the health benefits for homeless citizens, continues to counsel troubled youth and gang members through conflict resolution and rehabilitation, and even wrote and recorded a song about the massacre on Black Wall Street. Br. Arthur has built a reputation both on the streets and in the courts as an honest straight shooter who genuinely cares about the people of his city. He is, so far as we know, the only Muslim nationwide who gathers guns from gang members on the street and turns them into the police department. Br. Arthur’s dedication to the Muslim ummah and the community at large shines through everything he does. He is a living example of how dawah should be performed: just do good and care about people. During a meeting between Br. Arthur and Imam W.D. Mohammed, Imam Mohammed charged Br. Arthur with a special mission. “Allah gave you a gift for making friends, use that gift to serve the community and to improve the Muslim image in the outer community.” And that is what he has been doing ever since. In the early 80s, the talk among the Muslim community was Chicago’s newly established American Islamic College. 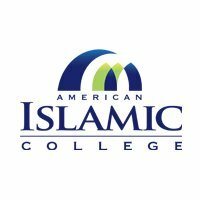 Founded under the auspices of the Organization of Islamic Cooperation (OIC) in 1981, the college’s goal was providing four-year college leading to Bachelor of Arts degrees with an Islamic perspective in subjects like education and social studies, as well as Islamic and Arabic studies. The dream was to serve the Muslim and non-Muslim communities with sound academic programs and active community involvement. The location was certainly conducive to those aims, with facilities built on landmark real estate that afforded both a beautiful campus and good access to other services and universities. 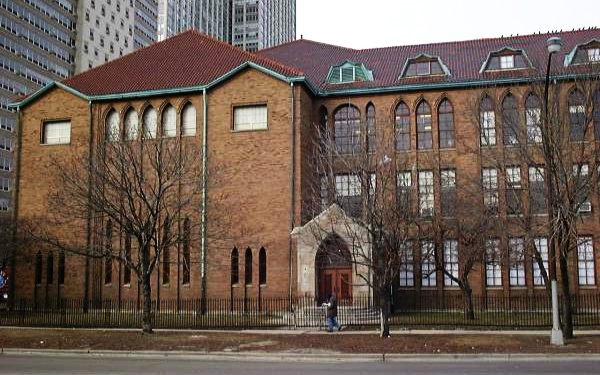 “Bittersweet Place” is the road that brings one to the entrance of the college’s 640 W. Irving Park address, and bittersweet exemplifies the story of the American Islamic College. In the late 1990s the university hit a point of stagnation and its accreditation was rescinded. But just like the proverbial Phoenix, the American Islamic College is rising again – with new blood, renovated facilities and a new outlook. To begin the dream of reopening, the executive management dug in and began rebuilding the institution they so believed in. Their first obstacle was the facilities themselves. Part of the building has been rented out to a French school and a French Montessori school. The parts of the school that had not been rented out , was left in disrepair for many years. Roofs were leaking, floors were damaged, equipment was ruined. The AIC spent $600,000 renovating the dorms alone. Then once they had the facilities in shape, they turned to rebuilding the academic programs that would be the real heart of the university and getting the accreditation to put them in operation. The OIC, in cooperation with the executive management, appointed Chicagoans to the Board of Trustees. These prominent community members brought many years of academic experience to the AIC, and provided the accountability and accessibility that makes for a successful governing body. Receiving accreditation for a university is not a one-step operation. The AIC has applied through the Illinois Board of Higher Education for Operating Authority. This authority, which will allow AIC to offer for-credit courses, is expected to come through in the next few months. Degree-granting authorization takes a bit longer and the application is in full swing. They hope to be offering for-credit courses in the fall of 2012 and degrees within the next 3 to 5 years. The first degree offerings will include Bachelors and Masters in Islamic Studies and Imam Training. Later degrees in economics, media, political science and other subjects will be available. But the American Islamic College is not just sitting back waiting for all that to happen; in the meantime, they’re working to overcome the largest obstacle of all. Those who lived through the past three decades and witnessed the university’s first incarnation were left with little faith in the institution. The new management has a long-range plan for earning back their confidence, and it includes the college, the Islamic community in the US, and the community at large. They’ve begun with a free lecture series featuring prominent academics, politicians and writers. The series is open to the public and has had an enthusiastic response. interfaith activities are helping AIC renew its relationships with adherents of other faiths as well. An interfaith garden, an open arms attitude toward visitors and a Sounds of Faith program are among the projects that are revitalizing interfaith ties. In addition, the university has hosted two “Islam and Muslims in America” conferences that brought together Muslim scholars and national politicians. While they are awaiting full accreditation, the university is also offering non-credit courses in subjects like Islamic studies, Arabic studies, Sufism, Classical Arabic Music and Turkish Ebru (The art pf paper marbling with oil paint on water). These courses are being attended by students from neighboring universities. With a local Board of Trustees and Executive council in place, a curriculum developed by experienced professors, a league of qualified, prominent instructors and a beautiful facility with a sparkling new library, auditorium, lab, cafeteria and dorm, the American Islamic College will be ready to receive students from overseas, from Americans across the US and from Chicago itself. The university is ready to become the home of future Muslim scholars, economists, media professionals and politicians.